Love golfing and want to practice with whatever spare time you have? Well, hitting plenty of golf balls on the driving range doesn’t mean your skill would improve, and you will also spend a whole lot on balls as well. 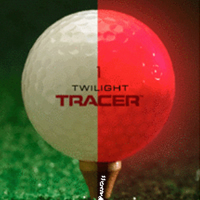 The Twilighttracer Golf Ball might offer something different to your game, where a £9.95 ‘investment’ will feature a powerful internal LED that can flash colored lights for up to 5 minutes after you hit it, easily letting you enjoy some golfing during low light conditions. This means you can even enjoy a round of golf late into the night if you are in the mood, since finding your ball long after you drive it far into the green isn’t too hard. Boasting a battery life of 80 hours, you can keep this ball flashing for approximately 1,000 strokes, now how about that? It is also legit to use in games, being the official size and weight of the U.S.G.A. and R&A, while boasting a tough Surlyn cover which prevents it from being damaged and losing its healthy glow. Each purchase will come with a couple of tees and a carrying pouch. Is this the Coolest Swimming Pool Ever? I love it! There are so many times when I want to tee off when it’s cheaper (sunset) but I worry about losing my golf ball. Cool ball!